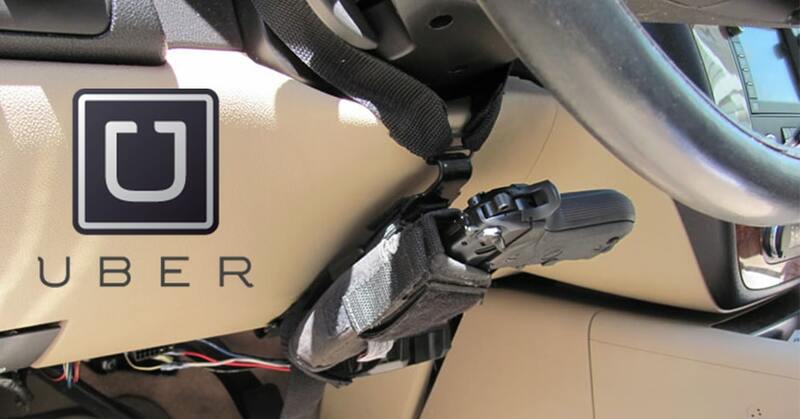 Police arrested a 41 year old Uber driver after he allegedly pointed a gun at another driver because he was annoyed that she was texting while driving. Apparently the man noticed that another driver was texting while driving and that he then drove in front the texting driver’s vehicle and “tapped his brakes” multiple times. The driver who was allegedly texting then attempted to pass the Uber driver at which time he allegedly pointed a black pistol at her while she passed. Police arrested the Uber driver who apparently did have a black Glock pistol in his center console. The Uber driver admitted that he was annoyed by the texting driver but claimed that when she passed, he waived his mobile phone at her and not the pistol. We will put to the side any criminal law aspects and focus on some of the points which are relevant from an injury / accident law perspective. First, if the woman was indeed texting while driving then she was commiting a very dangerous act which could have caused a car accident and resulted in personal injuries or even wrongful death. In 2016, distracted driving was reported in crashes that caused the deaths of 3,450 people. Drivers are not allowed text, use social media, browse the internet, or engage in other similar activities when driving a car. Florida has enacted the “Florida Ban on Texting While Driving Law.” F.S. 316.305. Someone who texts or uses other social media while driving and causes an car accident with personal injuries may be held liable for their negligence, including negligence per se for engaging in this dangerous activity. If you were involved in a car accident where texting while driving, or distracted driving was involved it is important to see an experienced car accident lawyer who can seek evidence to prove this dangerous activity in court. Of course, no one should be texting or emailing while driving a car. Second, we noted that the man who allegedly tried to correct the texting woman’s behavior by brandishing a gun was an Uber driver. It is a bit frightening to think that anytime we step into an Uber, Lyft, or other ride sharing service we may be stepping into a vehicle where a loaded gun is present but this is part of the sharing economy that we live in today. If you have a personal injury in a vehicle as a passenger in a ride sharing service like Uber, there are some special aspects that would need consideration by an injury lawyer. One is that, unless the Uber driver has purchased a special coverage or a policy rider, then the Uber driver’s insurance may not cover your accident. This is because personal auto policies exclude coverage when a personal vehicle is used as a public or livery conveyance (car-pooling excepted). This possibility (the possibility that the other guy won’t have insurance coverage for your injury or accident) is one reason why everyone should carry Uninsured Motorist coverage on their own personal policy. According to Uber’s website, while an Uber driver is online with Uber before accepting a request, the Uber driver is covered for $50,000 per person/$100,000 per accident for bodily injury and $25,000 per accident for property damage. But these amounts vary by state. Uber says that while a an Uber driver is driving to pick up a rider after accepting a request and during an Uber trip, the driver is covered for third party liability coverage for at least $1,000,000 per accident, but again this amount varies by state. When a personal injury results from a car accident involving an Uber, Lyft or other ridesharing service, the insurance aspects can become very complicated. It is recommended that anyone involved in one of these accidents contact an experienced car accident attorney to protect your rights. Todd C. Passman, P.A. handles Auto Accident cases involving distracted driving and Uber, Lyft and other ride sharing services serving Fort Pierce, Port St. Lucie, Vero Beach, Stuart, and Okeechobee, Florida, and surrounding areas. We have an epidemic of dangerous auto accidents here in Florida and on the Treasure Coast in particular. If you, a family member or a friend have suffered a personal injury in an auto accident, or have questions please contact Todd C. Passman today, at (772) 465-9806 or or fill out the contact form on this page. Someone from our office will contact you right away.